This article originally appeared in Success Magazine in March 1906. It was a very slight girl who said this, a girl with a thin, pale face, very serious brown eyes, and a mass of most rebellious dark hair, neither long nor short, just “coming in,” after an attack of typhoid fever. An utter stranger might well have questioned what it could be that such a frail person could lead the world in. 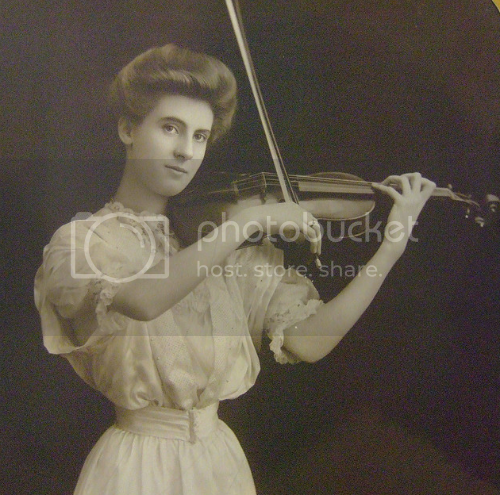 Yet that girl of twenty-one can almost lay unquestioned claim to be the greatest woman violinist, and she is compared with Kubelik, her friend and benefactor, pupil of the same master. But as I talked with Miss Marie Hall, the day after her second New York concert, her pale face grew animated, her eyes opened wide and flashed, and her words came with a decision that revealed a soul on fire with her art, and a determined will to great for her slight frame. One felt almost a pitying fear that her efforts would over-tax her strength. As Miss Hall talks, one forgets her frailty, so sure of herself is she, and so full of her music. And the impression of an iron will and a dogged determination keeps recurring as she tells incident incident of her rise from street and music-hall playing to a place among masters of the most human of instruments. She had won by the weapon she has used ever since – winning prizes, tuition, instruction by the best masters, and now financial and artistic success. “I have been lucky,” she went on. “I have always found friends to help me, I don’t know why. And if people won’t do what I want, I play for them, and generally then they do what I want,” and she gave a roguish smile as she thought of the magic power she keeps in little, slender, white fingers. It was thus she won Kubelik, and through him his master, Sevcik, with an audacity that surprises when one thinks what she must have been at sixteen. Kubelik was taking London by storm. “I went to hear him,” related Miss Hall. “I saw immediately that he had something I never had been taught, and I felt sure that it was from his teacher. I heard all his concerts, and I resolved that I, too, would learn that wonderful technique. I waylaid Kubelik – I was only sixteen, and my long hair was hanging loose. I told him I wanted him to hear me play. He smiled, and seemed amused, but consented. I went next day. His accompanist met me, and, seeing my violin, said, “But are you really going to play to him?” “Of course I am,” I answered, “that’s what I came for.” Kubelik came. He was very kind, but still seemed amused. I told him I wanted to know who his master was, who had taught him to play so, for I wanted to go and learn to do so too. He said, “I’ll hear you play first. I suppose you play from memory?” “Of course I do,” I replied with spirit, and then I played him two concertos that he had played the day before. He said it was wonderful, that I must go to his master, Sevcik, at Prague. The girl’s audacious proposal met with strong opposition from her master and her benefactors, who were supporting her in London. When there was no other way to gain her point, Miss Hall declared that if she could not go to Prague, she would quit studying and go home. She had her way, and it proved for the best, just as her decision for the violin and against the harp was for the best. Then the ambitious girl tried for a Royal Academy scholarship, and won in the competition, only to find that it meant merely tuition, and there was no money to pay her board in London. She had to give it up, and go back to playing for her father in concert halls, and even on the street, for the family was then desperately poor. They wandered to Bristol, and there something in the little minstrel’s playing appealed to a musical clergyman, now Canon Fellowes, of Windsor. He asked her to his house, found out her poverty, her genius, and her ambition, and interested wealthy friends in her. Here again her unambitious father was an obstacle. He did not want to sign an agreement to give her to others’ care for a three years’ systemic course. When provision was made for the family, to compensate for the loss of her now valuable earning capacity, he consented, and the way was clear to accomplish all that the girl’s genius was capable of doing. Then came Kubelik. When she had won consent to go to Prague, Kubelik aided her in every way, even to securing an apartment for her, and won over his old master, Sevcik, and Dvorák, director of the Conservatorium, to a lively interest in the little English girl. When Miss Hall talks of Sevcik and his method, she grows enthusiastic. She says no one else on earth teaches such technique, and in such a systemic way. To that method she ascribes her sureness, and the confidence with which she attacks the most difficult concertos. On entering the Conservatorium, her attainments were recognized, so that she was admitted to the sixth year work, and in one year she had completed the whole course. Then for five months Sevcik gave her private lessons, – his “little concerts” he called them, so delighted was he with her playing. 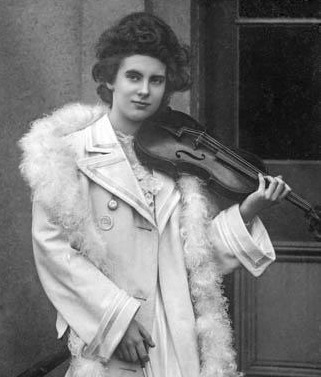 When she gave her “coming out” concert in Prague, to invited guests, they recalled her over a score of times after her rendering of Ernst’s concerto in F sharp minor. 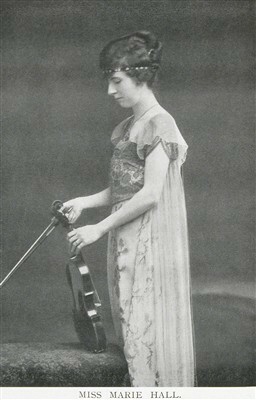 Two gold caskets and a laurel wreath were hers before she left Prague for other triumphs at Vienna, and then her appearance at St. James Hall, London, where the enthusiasm is said to have been unequaled since Rubinstein took London by storm. The long years of patience practicing (four thousand bowing exercises, she told me,) the alternate hope and despair, and the struggle with unappreciative parents and dire poverty had borne fruit – she was a great concert performer. For those of you who didn't know, The Lark Ascending was dedicated to Hall and premiered by her. 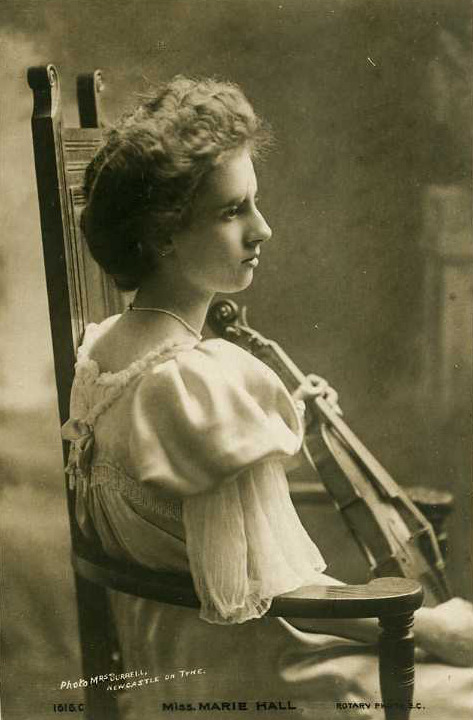 Even more of her personality comes through in a super-long interview with Strand Magazine in 1903... She loved oranges, liked to shock people during her teenage years in Prague, and she wanted to be a conductor! I wonder if she ever fulfilled that dream. I love the throw away line "just getting over a bout of typhus". That in itself required a pretty strong constitution, but anyone who could teach themself Paganini is obviously made of stern stuff. Yeah, Betsey, there's this tendency for people to think of all Victorian women as corseted china dolls, but there were many, many women who broke societal expectations. They're proof that, male or female, we can do the same today.